The Digital Humanities Research Network invites everyone who has been a part of our group in any capacity this year to join us for a year-end celebration! We will meet in the Fluno Center’s Study Pub on Tuesday, May 10 at 4:30 p.m. for a fun, informal gathering. Bring your memories of our past two years as a Borghesi-Mellon Workshop through the Center for the Humanities, and your ideas for our future as a project of the Center for the History of Print and Digital Culture. Thank you to everyone who came out for Laura Mandell’s lecture last Friday and for all those who followed along and participated via Twitter — it was a wonderful capstone to the conversations about digitization, quantification, archives, and sustainability that we’ve been having all year. For our next meeting, we would like to take some time to reflect on Laura’s talk as a group and put it into conversation with some of her published work, as a way to open up onto larger questions about the state of digital humanities work today. We welcome those of you who attended the lecture as well as those who weren’t able to, and we’ll spend a little time at the beginning refreshing all of our memories about the key take-aways from the talk. Laura Mandell, “What Is the Matter? Or, What Literary Theory Neither Hears nor Sees,” New Literary History 38.4 (Autumn, 2007) — we will focus on the big claims she lays out in the introductory section, which runs from page 755 to the top of page 759. Laura Mandell, introductory chapter to Breaking the Book: Print Humanities in the Digital Age (Wiley-Blackwell, 2015) — we will again focus on the framing, big-picture parts of the chapter, which you can find on pages 3-9 and page 62. Friday, April 15, 2015 at 4:00 p.m.
Laura Mandell is a Professor of English at Texas A&M University, where she also directs the Initiative for Digital Humanities, Media, and Culture. Her 2015 monograph, Breaking the Book: Print Humanities in the Digital Age, explores the cognitive consequences and emotional effects of human interactions with physical books and reveals why the traditional humanities disciplines are resistant to digital humanities. She is also the author of Misogynous Economies: The Business of Literature in Eighteenth-Century Britain (1999) as well as the editor of a Longman Cultural Edition of The Castle of Otranto and The Man of Feeling. Her article in New Literary History, “What Is the Matter? What Literary History Neither Hears Nor Sees,” describes how digital work can be used to conduct research into conceptions informing the writing and printing of eighteenth-century poetry. She is Project Director of the Poetess Archive, on online scholarly edition and database of women poets, 1750-1900, Director of 18thConnect, and Director of ARC, the Advanced Research Consortium overseeing NINES, 18thConnect, and MESA. Her current research involves developing new methods for visualizing poetry, developing software that will allow all scholars to deep-code documents for data-mining, and, as part of the eMOP project, improving OCR software for early modern and 18th-century texts via high performance and cluster computing. In his book Macroanalysis, Matthew Jockers argues that we have reached a “tipping point.” Now that we have so much digital data, we can use techniques and methodologies used to explore big data: text mining, topic modeling, machine learning, named entity recognition, etc. Two problems confront digital literary historians of women writers who wish to apply these methodologies. First, the number of women writers who published works before 1800 in Britain and America, as well as the number of their publications that have been preserved, is small compared to men, a problem compounded by how few works by early modern women writers are currently being digitized: roughly 4% of 307,000 volumes in the Early English Books Online and Eighteenth-Century Collections Online were written by women writers. Second, many of the data analysts currently comparing what they call “female writing” to “male writing” propagate rather than interrogate stereotypes about women and women writers. Sociologists have worked on such problems, and in this talk, I will outline some of their strategies and discuss how literary critics who wish to perform macroanalysis might make use of them. Data scientists in the commercial world have worked on the problem of representing minorities “fairly” even when they are represented by a small sample. Thanks to the robust history of feminist theory and criticism, we have the means for generating vocabularies, taxonomies, and ontologies for semantic searching and supervised topic modeling that differ from those generated through big-data techniques that naïvely privilege historically oppressive discourses. Second, the need to shift from quantitative to qualitative analysis (and back again) is augmented when analyzing textual data produced by minorities. I argue that, once again, the concern for social justice enhances intellectual work by effectively demonstrating the inadequacies of claiming “new” discoveries based upon “statistical significance” alone. Join us for two exciting events with Thomas Padilla, Digital Scholarship Librarian at Michigan State University! Thomas Padilla will talk with us about his experience growing library Digital Humanities engagement at Michigan State University. In particular he will focus on the opportunities that the Digital Humanities offer for highlighting both existing and potential library value as it pertains to people, services, and collections. Thomas Padilla will talk with us about the theory and practice of doing computationally inflected work in the Humanities. This conversation will draw on Thomas’ experience exploring and communicating the concept of data in the Humanities, studying data use and research data production in the Humanities, articulating the primary value that data curation plays in Digital Humanities research and pedagogy, and will extend to consider the benefits and considerations that should be taken into account when working with objects commonly studied in the Humanities as data. Thomas Padilla is Digital Scholarship Librarian at Michigan State University Libraries. He publishes, presents, and teaches widely on Humanities data, data curation, and data information literacy. Recent national and international presentation and teaching venues include but are not limited to: the annual meeting of the American Historical Association, the Humanities Intensive Learning and Teaching Institute, Digital Humanities, the Digital Library Federation, and Advancing Research Communication and Scholarship. Thomas serves as an Editor for DHCommons Journal and dh + lib Data Praxis. Thomas also currently serves as co-convener of the Association of College and Research Libraries Digital Humanities Interest Group. DHRN invites you to join us for a discussion with Marcus Cederström and Colin Connors from Scandinavian Studies. Their presentation will explore what it means to be a public scholar in the digital age by examining a collaborative project between Anishinaabe artist Wayne (Mino-Giizhig) Valliere—an Anishinaabe language and culture teacher from Lac du Flambeau, Wisconsin—Anishinaabe students from Lac du Flambeau, faculty and students from the University of Wisconsin–Madison, as well as Madison-area community members. The project resulted in an Ojibwe birchbark canoe that is on permanent display at Dejope Residence Hall, a short documentary film, a blog, a website, and a Facebook community page. All four of these are products of the canoe project. Marcus Cederström is a Ph.D. candidate on the Folklore track of Scandinavian Studies. His research focuses on Scandinavian immigration to the United States, the role of immigrants in the labor movement, and identity formation as well as North American indigenous communities and sustainability. He is a member of a team of folklorists working on Wiigwaasi-Jiimaan: These Canoes Carry Culture, a public humanities project that began in 2013. Colin Connors is a Ph.D. candidate in the Folklore track of Scandinavian Studies. Colin’s research focuses on the Viking Age in topics of archaeology, saga studies, folklore, religion, and popular culture. He is part of the Folklore/Public Humanities project Wiigwaasi-Jiimaan: These Canoes Carry Culture and he also leads the eSaga Project, supported by the UW Libraries and Department of Information Technology (DoIT). This week, DHRN welcomes Colin Connors, a Ph.D. candidate in the Folklore track of Scandinavian Studies. Colin’s research focuses on the Viking Age in topics of archaeology, saga studies, folklore, religion, and popular culture. He is part of the Folklore/Public Humanities project Wiigwaasi-Jiimaan: These Canoes Carry Culture and he also leads the eSaga Project, supported by the UW Libraries and Department of Information Technology (DoIT). Join us for a conversation about archiving web materials with Samantha Abrams, an early-career archivist and a student at the University of Wisconsin-Madison’s iSchool. Samantha works at Culver’s as a corporate archivist, and at the Madison Public Library, where she is assisting with the launch of a hyper-local Web archiving program. She is also involved in the development of a personal archiving lab at the Madison Public Library, through which patrons will have the opportunity to learn how to digitize and preserve personal items from home: photographs, home videos, and more. For this meeting, we’re very lucky to be hosting guest speaker Chuck Rybak, Associate Professor of English and Humanistic Studies at UW-Green Bay. He is a creative writer, a digital humanist, and a blogger who chronicles the politics of higher education in Wisconsin. He’ll be talking with us about building digital humanities at the undergraduate level. We’ll discuss broad issues of pedagogy, as well as specific tools that can be useful for undergraduate DH (Commons in a Box, Reclaimed Hosting, etc.). To prepare for the meeting, we ask you to take a look at this link. This week we’re pleased to welcome Martin Mueller, Professor Emeritus of English and Classics at Northwestern University. You can read more about his wide-ranging research here. The topic Professor Mueller would like to discuss with us is the use of undergraduates and retirees to crowd-source the cleaning of textual data in large corpora, such as the EEBO-TCP corpus that has come up a few times this semester in our meetings. He’s interested in developing systems that combine machine learning methods with human labor to clean large, messy sets of incompletely transcribed texts, while also reconciling the conflicting expectations that researchers from different fields have when working with textual data. We expect this conversation will build on our earlier discussions about the technical side of text mining and corpus curation, while giving us an opportunity to address some of the questions of labor that are a major concern for sustainability in digital humanities. This week we’re excited to feature two guests from the School of Library and Information Studies! First, Bronwen Masemann, Faculty Associate Librarian at SLIS, will deliver a lightning talk about her plans for her Spring 2016 course, “Digital Humanities Project Toolkit.” The course, which was first offered in Spring 2015, provides a hands-on introduction to data-driven, collaborative approaches and technologies in humanities research. She is particularly looking for discussion about possible collaborations between students and DHRN members. If you have a problem related to data, metadata, visualization, grant-writing or preservation, and would like to partner with a team of enthusiastic students from SLIS, she would love to hear from you! The course is open to graduate students and senior undergraduates from departments outside SLIS, as well as SLIS students. Further information on the Spring 2015 class is available here. Kristin Eschenfelder is a Professor and Director at the School of Library and Information Studies at the University of Wisconsin-Madison. She is also an affiliate of the Holtz Center for Science and Technology Studies, the School of Journalism and Mass Communications and a founding board member of the Wisconsin Digital Studies program. Her research interests focus on information access, sharing and rights management. She writes about use regimes – or the complex, multi-level networks of laws, customs, technologies and expectations that shape what information we can access in our daily lives and how we can make of it. Her recent work examines development of and changes to access and use regimes for data archives and digital scholarly works including electronic publications (journals, books, citation databases), digital cultural materials, (such as museum, archival or anthropological works) and data sets. Her past work explored web based government information and policy and management issues inherent in digital production of government information and records. She has also published in the areas of public libraries and financial literacy. For our next meeting, DHRN is excited to offer a “Cool Tools” session, featuring a number of brief presentations from members about digital tools we use in our day-to-day work — Tiki Toki, Scrivener, Canva, NVIVO, and R for tabular data, to name just a few! If you’d like to participate, please email Brianna by Thursday, 11/12. Talks are expected to be short — around 5 minutes each — so this is a very quick and informal opportunity to share something that makes your job easier or more fun. This week we’re excited to offer a hands-on workshop led by Peter Gorman, Assistant Director for Digital Library and Preservation Strategy for the University of Wisconsin-Madison General Library System. Peter will give an introduction to the Text Encoding Initiative (TEI), “a consortium which collectively develops and maintains a standard for the representation of texts in digital form. Its chief deliverable is a set of Guidelines which specify encoding methods for machine-readable texts, chiefly in the humanities, social sciences and linguistics.” (http://www.tei-c.org/). He will show how TEI markup can be used at escalating levels of complexity, from rough structuring of page images/OCR to critical editions to morphological segmentation of texts. He will also show examples of how TEI texts may be linked to external data sources such as geographic and personal name authorities. In this lightning presentation, Mark will discuss the difficulties of searching for anonymous texts in Eighteenth Century Collections Online and how he worked around the limits of the web-based user interface. Mark Vareschi [Vuh – res – key] is an Assistant Professor in the department of English at the University of Wisconsin-Madison. His work in eighteenth-century literature and culture is situated at the intersection of literary history, media studies, and digital humanities. He has published in Eighteenth-Century Life and the journal Authorship. He has an essay forthcoming in English Literary History and is completing his book manuscript entitled “Everywhere and Nowhere: Anonymity and Mediation in Eighteenth-Century England.” He has received fellowships from The Folger Shakespeare Library, the Center for Cultural Analysis at Rutgers University, and the NEH. He recently completed a fellowship at the Center for 21st Century Studies at the University of Wisconsin – Milwaukee. Morgan Lemmer-Webber specializes in classical art and archaeology with a focus on gender relations and women’s agency. Her research studies the ways in which changing depictions of women in ancient art reflect their position within the social hierarchy. She is particularly interested in women’s role in textile production, the persistence and adaptation of classical ideals of femininity, and women’s presence in the public world. The Digital Humanities Research Network hopes you will join us for our third meeting of the semester, which will address the topic of text digitization and curation, with a focus on the subscription database Early English Books Online as a case study in the promise and perils of digitizing and encoding the cultural record. We are very fortunate to be hearing from Deidre Stuffer, who will start off the meeting with a lightning presentation titled “Always Already Encoded: Digital Curation and the Visualizing English Print Project.” In it, she will discuss her work curating an early modern drama corpus for Visualizing English Print. Extracting plain text from digital artifacts isn’t as straightforward an operation as it may seem, given the imbricated nature of text and code. Deidre will describe the human and computational levels of editorial intervention behind the drama corpus, offering not only principles for curating text-based corpora, but a dose of sympathy for those who tangle with text extraction and character encoding. Deidre is a Ph.D. student in literary studies at UW-Madison, and she serves as a Research Assistant and Digital Bibliographer for the multi-institutional, Mellon-funded Visualizing English Print Project. A specialist in 18th-century British Literature, her research focuses on the history of reading and writing technologies, mediation, material networks, and Early Modern English dictionaries. “Text: A Massively Addressible Object,” by Michael Witmore, formerly Professor of English at UW-Madison and now Director of the Folger Shakespeare Library in Washington, D.C.
Let Mattie know if you have trouble with those links or would like access to a PDF copy of the readings. What is the value to you of a sustainable DH? To campus? What are some steps that DHRN can take to move in this direction? Christine Lupton is the manager of Faculty Engagement Community Programs in the Department of Academic Technology, where she has worked since 2000. These programs provide support to faculty, staff and instructors for transforming teaching and learning through technology, by exploring, developing and evaluating Communities of Practice. She keeps her hand in teaching through a Chadbourne Residential College First Year Interest Group and several evening courses for returning adult learners at Concordia University. In addition, we’ll also hear a Lightning Talk from Cid Freitag of DoIT Academic Technology. She’ll be talking about Hypermedia-based Critical Readers, which are interactive texts with multimedia links. Her division has built an authoring tool here for creating these readers, which have been used to help guide students through a process of deeply reading a text. Cid will demo text examples, show us the authoring tool, and solicit feedback about research potential. Our first meeting of the semester will be an informal opportunity to catch up with familiar faces, welcome new members to the group, and talk about what we want DHRN to look like this year. Our theme for 2015-16 is “Sustaining Digital Humanities,” so our guiding question for discussion will be: what would it look like to have a sustainable digital humanities presence on the UW-Madison campus? If you’re curious about the history behind this question, check out pages 36-37 of this 2014 report that treats UW-Madison as a case study in the particular challenges of maintaining a DH community on a decentralized campus. Snacks will be served at the meeting, and we’ll meander to City Bar afterwards. At this meeting, we’ll work together to create a Storify of tweets from the DH + A symposium, and we’ll also consider other ways of documenting and sharing our reflections on the event. In addition, we’ll hear a lightning problem from Heather Froelich, a PhD student at the University of Strathclyde (Glasgow UK) who studies gender in Early Modern plays using computers. Her thesis draws heavily from sociohistoric linguistics and corpus stylistics, though she sustains an interest in digital methods for literary and linguistic inquiry. You can read more about her and her research at http://hfroehli.ch and on Twitter (@heatherfro). I will be talking through some of the questions raised in my twin blog posts about identifying vocatives for social class using concordance plots (http://hfroehli.ch/2015/02/24/how-to-address-many-concordance-plots-at-once-2/ and http://hfroehli.ch/2015/02/26/a-cautionary-tale/). Vocatives are nouns which function as terms of address, and are generally used towards addressees to evoke social relationships. Social class may be closely tied to the process of characterization and character construction, a crucial part of understanding dramatic worlds. I will address whether or not vocatives for social class in a bigram with a name correlate with character construction as a part of dramatic structure. Satellites, birds, rice crops, supply chains, feces; how have these elements come into visibility as parts of one network constituting the ecologies of global pandemics? In this talk, Kim explores the efforts of researchers in fields such as wildlife and environmental management, computer science and epidemiology as they transform avian bodies and movement into data visualizing technologies in the hopes of anticipating the possible futures of a global avian flu pandemic. Implanted with RFID and biothermal chips, and outfitted with GPS devices, migratory birds and their flocking systems are being charted around the world with the goal of detecting how, when and where viruses mightspillover from animal to human populations. Kim asks how these bird sentinels, and the bestial logic of their flocking patterns, function as a collective biosensing mechanism. She explores the relationship between bird sentinel technologies, data visualization and the making of new forms of “transnatural kinship,” situating these within the politics of anticipation that attend the cultures of 21st century risk. Bio: Gloria Chan-Sook Kim is 2015 Provost Postdoctoral Fellow at the Center for 21st Century Studies at the University of Wisconsin-Milwaukee. Her research analyzes the political, cultural, ecological, technological and economic projects that take place around emerging infections. She is currently writing a book on the premediation of emerging infectious diseases and is conducting research on the mapping of the global microbiome. As 2012-2014 Andrew W. Mellon Postdoctoral Fellow, Gloria has taught courses on technology and the public sphere, biomedia and visual culture in the Program for Media Studies at Hobart and William Smith Colleges. Her research has been supported by the American Council of Learned Societies, the Susan B. Anthony Institute for Gender and Women’s Studies, and the Andrew W. Mellon Foundation. “Looking for Nothing: Searching for Anonymity in ECCO” | This will be both a lightning presentation and problem in which Mark shows a bit of his ongoing study of the appearance of the term “anonymous” in a decade-by-decade survey of Eighteenth Century Collections Online. As a lightning problem, he hopes to both assess the quality of his methods with the group and to find a more efficient and/or accurate way of constructing this study. Jesse and Cathy are co-teaching a Shakespeare MOOC for UW that will go live at the end of April. Currently the course has over 10,000 students enrolled from 130 countries, many of which are developing countries. In their lightning problem, they’ll solicit feedback on developing community ties across time zones and media platforms. They are specifically interested in discussing strategies for analyzing and collecting social media data throughout the course to assess community formation and involvement. In her dissertation, katrina uses historical records to explore how U.S. state actors made decisions about granting and revoking military benefits to Filipinos after World War II. She is new to the digital humanities and particularly interested in learning more about tools, methods, and programs that might be useful for topic modeling and textual analysis on a corpus of archival data. RSVP on Facebook and join the conversation on Twitter: @UWDigHum and #uwdh. How is racial inequality addressed in the digital sphere through social media? In The Wretched of the Earth, Frantz Fanon makes a stirring argument that colonialism cannot end without a radical shift in mainstream discourse, and issues a call to accomplish this through pioneering ideological innovations. But the media environment available to Fanon at that moment was drastically different from the one today. In this talk, I will explore the question: what if Fanon had Facebook at his disposal in the 1950s? By invoking “Facebook,” I am not limiting this question to that particular platform, but I want to gesture towards a larger conceptualization of knowledge distribution in digital ecologies. I ask: how would Fanon have reacted to the Internet and social media? How would he have tried to deconstruct and to reconstruct it for his own radical use? Adeline Koh is Director of DH@Stockton and associate professor of literature at Richard Stockton College. Her work spans the intersections between postcolonial studies and the digital humanities, 19th/20th Century British and Anglophone Literature and Southeast Asian and African studies, and games in higher education. Koh directs Digitizing ‘Chinese Englishmen,’ a digital archival project on 19th century ‘Asian Victorians’ in Southeast Asia, and The Stockton Postcolonial Studies Project, an online magazine of postcolonial studies. She is the designer of Trading Races, an elaborate historical role playing game designed to teach race consciousness in the undergraduate classroom, and co-runs the postcolonial digital humanities website and tumblr blog. She is a core contributor to the Profhacker Column at the Chronicle of Higher Education, and has held a Duke University Humanities Writ Large Fellowship and a postdoctoral fellowship at the National University of Singapore. She has published on diversity and the problem of exclusion in the digital humanities. Please join us for a brownbag discussion with Richard Grusin, Director of the Center for 21st Century Studies and Professor of English at UW-Milwaukee. Professor Grusin is the author or co-author of four books, including Remediation: Understanding New Media (MIT, 1999), co-authored with Jay David Bolter, and most recently, Premediation: Affect and Mediality After 9/11 (Palgrave Macmillan, 2010). We will be discussing his recent essay “The Dark Side of Digital Humanities: Dispatches from Two Recent MLA Conventions” (Differences 25.1 : 79-92). For a copy, hop on over to our Readings page; if you need the password, you can email cmderose [at] wisc [dot] edu. The Digital Humanities Research Network will be convening for our spring kickoff meeting on Monday, January 26th at 4:30 p.m. in the Fluno Center study pub. Although our regular meetings will be held in WID, this first session in the study pub is an informal regrouping to catch up and chat about any DH questions, topics, and ideas you have or would like to discuss during the spring semester. We hope to approach DH interdisciplinarily, and faculty, grad students, and staff from all fields are welcome! This spring, we will continue to hold meetings every other week to discuss and explore DH topics. These meetings will be held every other Monday from 4-6 p.m. in WID (room 2130) beginning February 9. We will also hold the second annual DH+A symposium featuring Professor Matthew Gold (City Tech and the Graduate Center, CUNY) as our keynote speaker on April 17. This third meeting of the series will be led by Brianna Marshall, Digital Curation Coordinator for UW-Madison Libraries. Brianna will introduce us to practical best practices for working with data, setting up experiments, and generating scholarly output in ways that promote preservation and sustainability. She will also address the new data management requirements for many federal grant applications. In addition to hearing from Brianna, we’ll also hear brief presentations from Joshua Armstrong and Kit Hughes about their current research. When:Tuesday, December 2, 4:00 p.m. Registration: For WID security purposes, please register in advance of the meeting at this Doodle poll: http://doodle.com/wcbximuywu6s9hge. To ensure you are on the list, please RSVP by 11 a.m. the morning of the meeting, especially if this is your first time joining us. The front desk will not let anyone upstairs who is not on the list. Think about the digital materials you generated 20, 10, 5, 1 year(s) ago. What can you still access? What can’t you access? Why? What kinds of materials are you generating now and what concerns do you have about them? How is the university thinking about research data vs archive data? Which digital formats does UW prioritize for preservation? How do efforts at UW fit into larger initiatives? Registration: For WID security purposes, please register in advance of the meeting at this Doodle poll: http://doodle.com/sdxmb3hcdpm7pexb. To ensure you are on the list, please try to RSVP by 11 a.m. the morning of the meeting. The front desk will not let anyone upstairs who is not on the list. Readings: Although there won’t be any readings for this session, you may find it useful to look over the informal minutes from the last meeting, which can be found on DHRN’s blog. DHRN will hold its next meeting on Tuesday, November 4 at 4:00 p.m. in our usual room, WID 2130. Ernst, Wolfgang. “Underway to the Dual System” and “Archives in Transmission” in Digital Memory and the Archive, ed. Jussi Parikka (Minneapolis: University of Minnesota Press, 2013): 81-101. Kirschenbaum, Matthew G. “Preface” and “Introduction: Awareness of the Mechanism” in Mechanisms: New Media and the Forensic Imagination (Cambridge, Mass. : MIT Press, 2008): ix-23. Parikka, Jussi. “Archive Dynamics: Software Culture and Digital Heritage” in What is Media Archaeology? (Cambridge, UK: Polity, 2012): 113-135. At our meeting on November 18, Peter Gorman (Head of UW’s Digital Collections) will lead us in a discussion about specific digital preservation efforts taking place at the institutional and national level. On December 4, Brianna Marshall (Digital Curation Coordinator for UW-Madison Libraries) will introduce us to practical best practices for working with data, setting up experiments, and generating scholarly output in ways that promote long-term sustainability. She will also address the new data management requirements for many federal grant applications. Danielle Albers Szafir, one of DHRN’s coordinators and a PhD candidate in Computer Science, asks that meeting attendees either (a) bring a specific dataset that they’re interested in analyzing and willing to discuss with people in the group, or (b) think about methods and approaches they’ve used for understanding and exploring data in the past. The lab meeting will again begin with lightning talks, after which Danielle will give a high-level overview of common computational and visual approaches to analyzing and exploring data. Afterwards, we’ll break off into groups blending people from (a) and (b) to think about how we might go about analyzing the datasets that people bring and do some hands-on paper prototyping. During the last half hour or so, we will bring the group back together and people can talk about some of the solutions that they designed and we can have some open discussion and critique about both the analysis methods used in each solution and existing tools that might be useful for making the prototyped analysis a reality. For this Tuesday’s (October 7th) Digital Humanities Research Network meeting, we will be starting at the same time, 4:00pm, but we are switching locations to University Club, room 313. Jesse Stommel, one of our group’s co-coordinators, will be giving a 40-minute talk on the public digital humanities for the Center’s Public Humanities Seminar Series. The talk will be followed by an open Q&A. Then, at 5:00pm, our group will stick around to discuss the readings below and whatever other issues the talk raises for people. Please see a virtual poster for the talk below. No need to pre-register since we will be at the University Club. We look forward to seeing all of you then! New-form scholarship reconsiders citation and peer-review, while re-imagining the containers and audiences for academic work. Digital platforms, like Twitter, open-access journals, and blogs offer both limitations and possibilities. The public digital humanities is built around networked learning communities, not repositories for content, and its scholarly product is a conversation, one that engages a broad public while blurring the distinction between research, teaching, service, and engagement. In short, the public digital humanities starts with humans, not technologies or tools. Join for a lively discussion about this new field, and discover new strategies for public engagement using technology. Brad Zellar is an author, journalist, and the Fall 2014 Interdisciplinary Artist-in-Residence at the UW-Madison Arts Institute with photographer Alec Soth. Sara Guyer is Director of the Center for the Humanities and Professor of English at UW-Madison. The Center’s new Public Humanities Seminar Series will examine the skills, practices, and questions that have long been essential to scholarship in the humanities, discuss their expansion into the public sphere, and support new thinking, projects, and research to enrich both higher education and the broader community. Seminar meetings are open to all. The Center for the Humanities advances innovative, interdisciplinary, and collaborative inquiry in core and emerging humanities fields at the University of Wisconsin-Madison and in the communities it serves. Our programs establish a coordinated vision for scholarly and public engagement with literature, history, philosophy, and culture through workshops, fellowships, seminars, curriculum development, and conferences. Each year we welcome world-renowned scholars from across campus and around the globe for public lectures, events, and projects. The Center could not undertake its array of programs without the essential support of the A.W. Mellon Foundation, the Anonymous Fund of the College of Letters & Science, The Brittingham Fund Inc., The Evjue Foundation, UW-Madison Libraries, Madison Public Library, and individual contributors. DHRN will be meeting again this Tuesday, September 23 in the Wisconsin Institutes for Discovery building, room 2130 from 4:00-6:00pm. For the first half hour of the meeting, we will have 5-minute presentations about past, ongoing, and anticipated DH projects members of the group have been involved in — if you would like to present your work at the meeting, please email Cathy DeRose <cmderose@wisc.edu> by this Sunday. For the remaining portion of our meeting, starting at 4:30pm, we will switch to our first tool demo of the semester. Jill Hopke, a dissertator in the Department of Life Sciences Communication, will present on collecting and analyzing Twitter data using the tool DiscoverText (please see an outline of her talk below). If you would like to use the tool at the meeting, please register for the 30-day free trial in advance at: https://discovertext.com/Home/TrialRegistration. We recommend registering for the tool as soon as possible since you will need to be approved by DiscoverText. Jill suggests coming with a research question in mind and/or a short list of topical hashtags and/or keywords to test out since we’ll have some open lab time following the talk for people who would like to work with the tool directly. A discussion about being priced out of DH work and about the importance of having a theory drive tool decisions will follow. 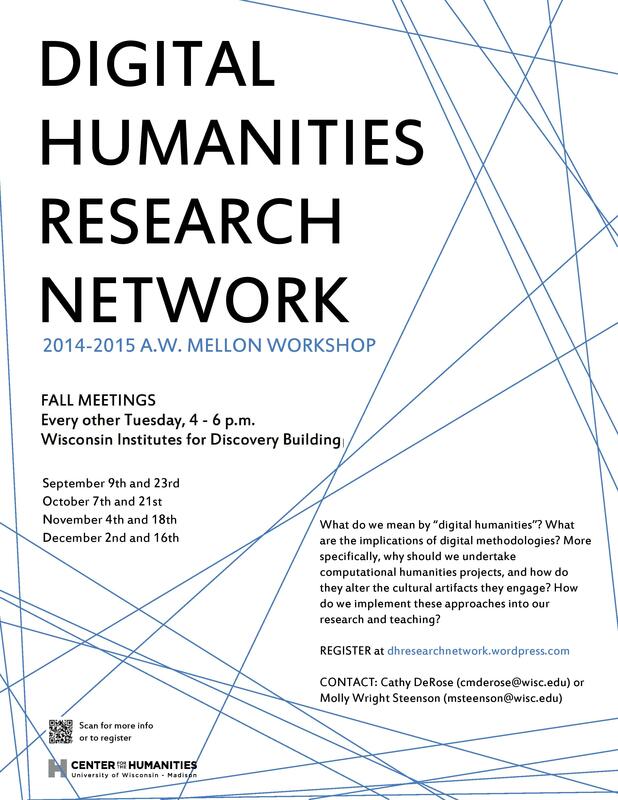 For more information, please visit the DHRN website: https://dhresearchnetwork.wordpress.com/ or contact Cathy DeRose <cmderose@wisc.edu> and Molly Wright Steenson <msteenson@wisc.edu>. What kinds of data can you get from Twitter? DHRN will hold its first meeting on Tuesday, September 9 at 4:00pm in room 2130 in the Wisconsin Institutes for Discovery (WID) Building. The readings for our first meeting come from the forum on search in the latest issue of Representations (127.1). Together, the readings address how digital tools have affected our research practices. The three readings we will focus on are the ones by Lisa Gitelman, Frederic Kaplan, and Ted Underwood. The articles by Leah Price and Daniel Rosenberg are encouraged but optional. Since this is our first meeting of the year, we will also discuss plans for future meetings and what we hope will be the long-term outcomes of our Mellon workshop.